The Reverend Dr Mark Short has been elected as the eleventh Diocesan Bishop of the Anglican Diocese of Canberra and Goulburn. The Episcopal Electoral Synod came together from 8-10 November in Goulburn to elect The Reverend Dr Mark Short. This synod consisted of 124 clergy and 175 lay representatives from across the diocese, voting according to the new Episcopal Election process which was adopted by Synod last year. 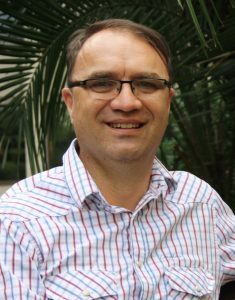 Mark Short is currently National Director, The Bush Church Aid Society, working in partnership with 17 Anglican Diocese and other Christian organisations across Australia to support gospel workers in remote and regional areas. in Durham he was an Honorary Assistant at St Nicholas Church of England. From 2002-2011 he was Rector of the Parish of Turvey Park and Priest-in-Charge of the Parish of Tarcutta. In 2007 he became Vocations Director Archdeacon, coordinating and overseeing the tri-Diocesan vocations process for new ordinands. From 2009-2011 he was Archdeacon of Wagga Wagga where he shared in the oversight of 20 parishes, Anglicare and School Ministry across that region. Formerly Mark worked as a Graduate Economist for the Commonwealth Department of Industrial Relations and Journalist for the Sydney Morning Herald. Mark (51) is married to Monica and they have two sons. His other interests include bushwalking, train travel, reading and exercise. of our 62 parishes and mission districts, eight schools and significant community agencies such as Anglicare and St Mark’s National Theological Centre. I am honoured and humbled by God’s call to serve you as the Anglican Bishop of Canberra and Goulburn. Monica and I give thanks to God for your partnership in the gospel and your commitment to living out the way of Jesus in your churches, communities, schools and workplaces. We are especially grateful for the care shown to us in recent months by Bishop Trevor Edwards, the Episcopal Election Nominations Committee, our support team and for the members of Synod who set aside time to read, pray, discuss and discern God’s will together. May the God who gives endurance and encouragement give us the same attitude of mind toward each other that Christ Jesus had, so that with one mind and one voice we may glorify the God and Father of our Lord Jesus Christ.